Has anybody here ever been curious about the origins of our friends, the Gyroids? Well, I'll get to that later. First, let's review our TAY friend database! Ok, so I'm sure most of you remember that friend code exchange a while back, right? Everyone was given the chance to hop in and give out their gaming info for their respective accounts in order to friend each other online. Well, our fellow TAYer, CallistoEx started up this neat little database where we have each others' information in one simple and comprehensive spreadsheet. I've been updating it regularly, so if you were late to the party, don't worry. Just click on this link to the original post, include your gaming data in a reply, and I'll personally add you to the list. And, although I wouldn't expect it to be a problem, if you have any issues with having your information disclosed to everybody on TAY, just give me a shout and I'll edit you out! Alright, now that we got that out of the way, onto my main topic for discussion . . . Anybody who's ever played Animal Crossing has surely encountered them at one point . . . I mean, in the Gamecube installment, one is your personal housekeeper, so to speak. It's kinda hardto NOT notice. But, has anybody ever wondered what they are? They may seem cute and innocent, but maybe . . . maybe, there's more to them than their odd shapes and sounds . . . Think about it. Where do you get them from? The ground. How'd they get there? Who knows! I'm sure most of you have your own theories, but after talking to my in-game neighbor and best friend, Jay, I think we're on to something . . .
Jay proposed to me that our town was built upon the ancient remains of an underground civilization. Now, Jay is the type of guy who would pull out his tinfoil hat at the mention of the Anunnaki, but there are several pieces of evidence that support his theory. For starters, this would imply that Gyroids could be the remains of the ancient ones. Or, hell, maybe they are the ancient ones. They seem perfectly capable of speech, monetary transactions, and even construction work . . . apparently. Then, there's this other interesting piece in the puzzle. 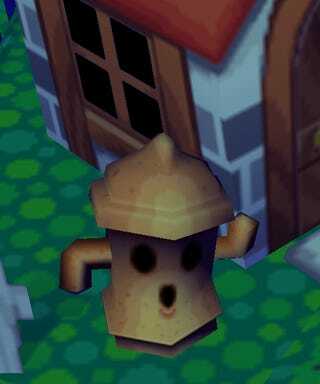 I'm sure some of you might've known this piece of trivia, but Gyroids were probably based on the ancient Haniwa of the Kofun Period of Japan. Dating back to 300 AD, the Haniwa were used as grave offerings to the dead of aristocratic class in Japan. And, curiously enough, they resemble the Gyroids a lot. So, this naturally would suggest that we are in fact, exhuming stuff from ancient corpsey peoples' graves . . . which isn't really all too exciting. I mean, am I the only one who wanted the outcome to be just a tad bit more paranormal or something like that? *sigh* . . . If there's any future game developers reading this, can you make me a promise? Please include something like a random ghost, creature or alien or something in your projects. Just throw it in subtly, very subtly, and leave it there for some unsuspecting gamer to run into. I'm sure players would have a field day with that . . .